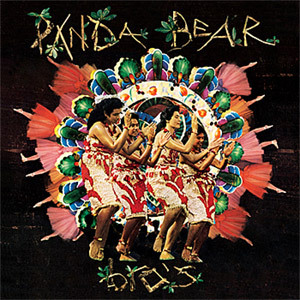 Of these two releases, Panda Bear’s is definitely the most inspiring. Coming ahead of a split twelve inch with Excepter and his third solo album, both due on Paw Tracks, and recorded last year in Noah Lennox’s home in Lisbon, this EP features two versions of the title track. The original is a hypnotic thirteen minute epic composition built around two distinct sections which are seamlessly blended into one. The first part of the track is particularly characteristic of Noah’s solo work. Layered over a linear shimmering guitar strum, Lennox’s vocals, somewhat set slightly in the distance, carry essence of sixties psychedelic pop and give this piece a luscious warm hue, but, as the musical backdrop become meatier, a more tribal tone emerges and eventually takes over, pushing the track in a direction which recalls early Animal Collective work. Formed of Black Dice’s Eric Copeland and fellow Animal Collective member Avey Tare, Terrestrial Tones evolve in a much more straightforward experimental field. Here, they give Bro’s a radical reworking by stripping it off its layers of sound and isolating Noah’s voice. The rest of the sonic space is filled with recurring elements which maintain a rhythmic effect all the way through. As these imperceptibly shift in and out of focus and the voice at times almost entirely disappears, Terrestrial Tones retain the atmospheric mood of the original but give the track a completely new dimension.